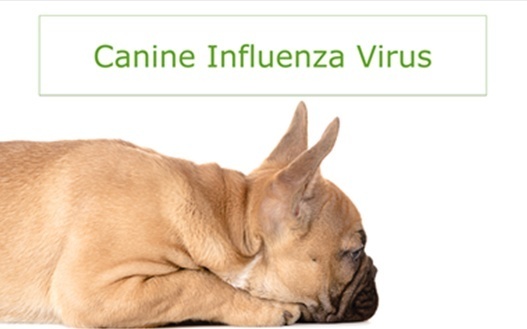 Canine Influenza, or CIV, is an upper respiratory disease that has been affecting dogs since 2004. For those of you who don’t follow this issue, Canine Influenza (CIV) was first detected in greyhounds in Florida in 2004, but it really hit the big time in Chicago in 2015. Since then CIV has been detected in all but 2 of the contiguous United States. Because CIV is a relatively new disease, dogs don’t have any natural immunity and the disease spreads rapidly when it hits a new area. To date, the Bay Area has been fortunate and we’ve had no detected cases of CIV (which of course means there could be some that are undetected). Also, fortunately, most dogs recover from CIV. At Pet Camp we’ve been taking steps to protect dogs from CIV for the past few years. In addition to our 6 UV germicidal air cleaning machines and general air flow and cleaning protocols, we also have a 30 day “hold “ period for dogs, which means that we won’t accept a dog into Pet Camp that has not been in the Bay Area for 30 days (the suspected period of being contagious with CIV is 21 days). But we are well aware that this is not enough. There is a vaccine for CIV. It’s not a perfect vaccine and you need to get your dog 2 doses, but the fact is that there remains a vaccine. The problem is that you can’t get the vaccine at a veterinarian in San Francisco because none of them are stocking it. The need to address CIV, coupled with the inability to access the CIV vaccine in San Francisco, led to an interesting meeting the other week. While there is plenty of competition in the doggie day care and lodging business, there is also plenty of shared concern about the welfare of the pets we take care of. This shared concern trumped competition as folks from Pet Camp, Wag Pet Hotels, Citizen Canine, and Waiterock Kennel joined together with San Francisco Animal Care and Control and Merck Animal Health to discuss ways to address CIV. Unfortunately, representatives from some of the other larger pet care facilities and San Francisco SPCA were either unable or decided not to attend. While no determination on a course of action was made, this meeting was an important first step in ensuring that those in the pet care profession (both the shelter and the for-profit sectors) are both educated about CIV and taking the steps necessary to protect your dog from CIV. If you’re concerned about CIV and its potential impact on your dog’s health, we encourage you to speak with us about what we’re doing to protect your dog. If you’re interested in getting your dog vaccinated against CIV BEFORE CIV comes to the Bay Area, we encourage you to talk to your veterinarian.